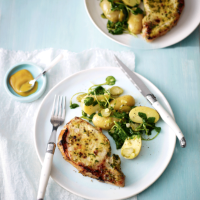 Honey and mustard are both classic ingredients in salad dressings, adding sweetness and piquancy – they are also ideal in helping bring out the full flavour of pork. 1. Cook the potatoes in a pan of boiling water for 15–20 minutes until tender. 2. Meanwhile, brush the pork steaks with 1 tbsp of the mustard and sprinkle with the herbs and some freshly ground black pepper. Grill the pork steaks for 5–8 minutes on each side until nicely browned and cooked through. 3. Whisk together the remaining 1 tbsp of mustard with the olive oil and lemon zest and juice to make a dressing. 4. Drain the potatoes and tip them into a large bowl. Add the dressing, cornichons and salad onions, and mix together until everything is evenly coated in the dressing. Stir in the watercress and divide the salad between 4 plates. Add a pork steak to each plate and serve. Charlotte potatoes have a lovely yellow flesh, which makes them perfect for salads, but they can be swapped for other varieties, particularly new potatoes – look out for the deliciously flavoured Jersey Royals that will be in season from next month. This recipe was first published in Thu Mar 26 15:43:24 GMT 2015.